Ocean Light is our Lagoon 42 catamaran (2017), offering 4 cabins with 4 heads, generator and A/C. The Lagoon 42 is a new member of the Lagoon family, which has style and a strong personality. An elegant silhouette, flowing curves which, by virtue of a noticeable acceleration of the lines in the bows and in the new coach-roof design, emphasize the powerful and dynamic nature of this new model. The mast moved further aft and the self-tacking jib, a guarantee of performance under sail and ease of handling, provide the ability to bring all operations together in one place. a closure panel for helming station safety when under way. a large glazed door that occupies the entire width of the coachroof, and provides access to the unparalleled internal volumes. The suspended steps at the transom provide a whole new perception of the boat: a continuous, wide and inviting platform, worthy of a large vessel. Attractive moulded wood emphasizes the smooth curves of the interior furnishings, designed with care by Nauta. 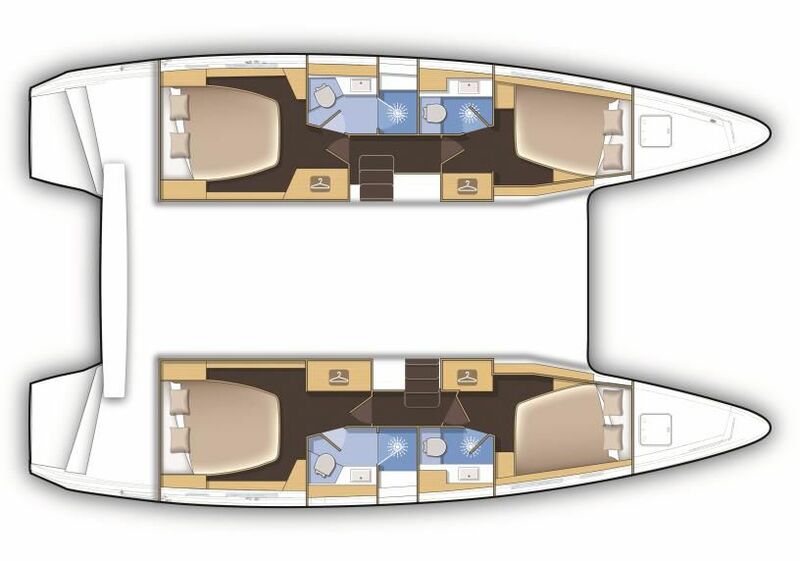 the U-shaped galley, fully fitted with broad work surfaces and extensive storage space, is oriented towards the external cockpit. Please note that some photos are stock photos, compliments of Lagoon. Interior and dock photos are of Ocean Light.